What was to be dinner with Brent turned out to be lunch to avoid light rain and snow in the Atlanta area this pm and eve and falling temperatures that would likely result in some freezing on the roads. Those that followed the storm that came through here 9 days ago that resulted in the largest gridlock in the history of the US know that there is a great deal of sensivity to this lind of weather where people have no way if dealing with it. Brent who works for the National Weather Service in Silver Spring, MD , has been in Atlanta since last weekend attending the American Meterological Society Conference. I had been planning to meet up with him and Cousin Ramona, weather permitting. So a last minute change of plans resulted in meeting son Brent with cousin Ramona and husband Doug at the famous Vortex Restaurant for lunch. 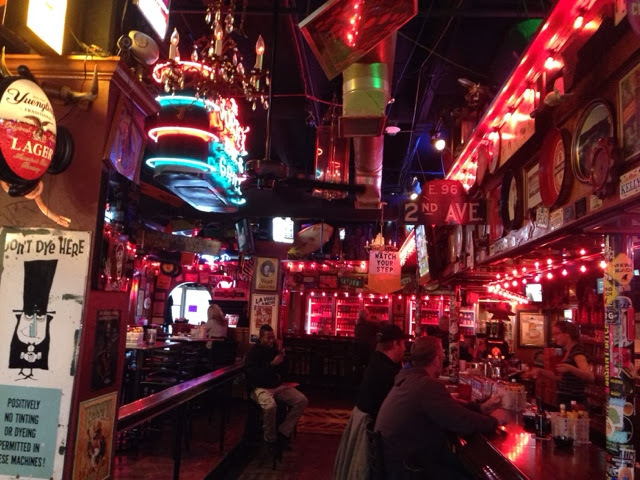 Avery busy bar/restaurant provided a bright setting in downtown Atlanta on Peachtree Street. 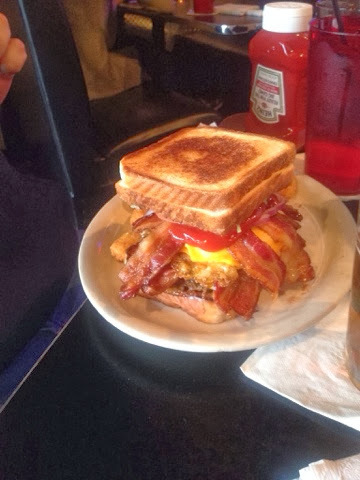 Brent II went for the Double Coranary Bypass that touts a burger in between two grilled cheese sandwiches, 2 fried eggs, 8 slices of bacon, and 6 slices of American cheese. Yes he ate it all including the side of tater tots. I got a burger too with jack cheese & quacamoli and my side of fried plantain. Here I am telling Ramona that I am good not having my photo taken. 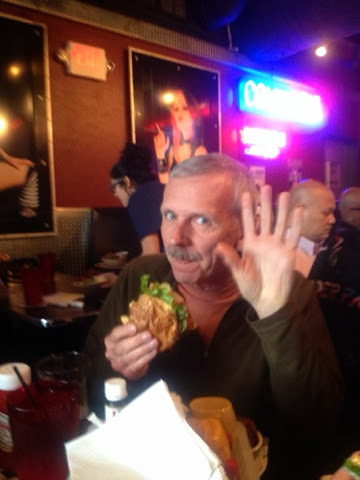 My burger not as bodacious as my son's, was good for my lunch and dinner. Brent did try to challenge me to what he ordered but didn't get sucked in. 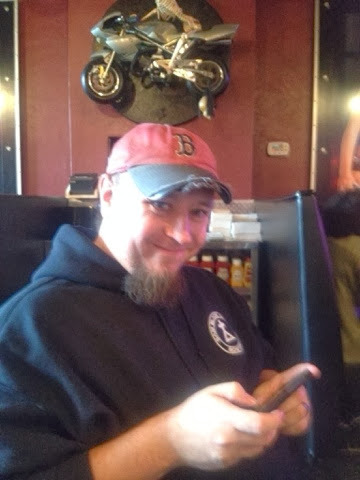 Here is Brent with his satisfying look. We dropped him off at the conference center to pick up his Weather Service Booth for his trip home tomorrow. In retrospect it was funny that AMS had their conference in Atlanta after the storm 9 days ago that saw roads gridlocked and children kept over at school. I would guess it gave the attendees something to discuss. On the way home Ramona, Doug, and I stopped by to visit aunt Pam. It was great seeing everyone over the past couple days. Off tomorrow for another long day back south. It's kind of cold here now that I have been south for awhile.